A gurdwara in California has been vandalised and the word "terrorist" scrawled on its walls in an apparent hate crime, days ahead of the first anniversary of the Oak Creek gurdwara shooting in Wisconsin. "The Sikh gurdwara in Riverside was vandalised on the night of July 29 in an apparent hate crime. 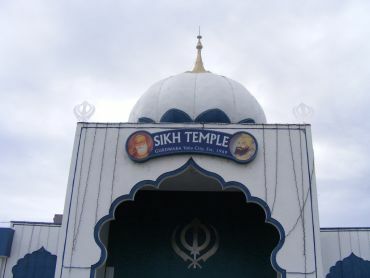 The word 'terrorist' was spray-painted around the complex," the Sikh American Legal Defence and Education Fund said.The group said it has been in direct contact with Riverside county sheriff department, the Riverside police department, the Federal Bureau of Investigation and the department of justice CRS urging them to investigate the incident as a hate crime. "It is horrible to see an attack of hate on a place of worship as we reflect on the lives lost one year ago during the attack on the Oak Creek Gurdwara," said SALDEF executive director Jasjit Singh. A year ago on August 5, 2012, six Sikh worshippers were shot dead by a United States army veteran and white supremacist, Wade Michael Page, who went on a shooting rampage in the gurdwara in Oak Creek. “Attacks and vandalism against any of the nation's houses of worship must be condemned by all Americans. These acts strike the very foundation of religious tolerance, a fundamental freedom this country was built upon," he said. "We call upon local and federal law enforcement agencies to rightfully classify this incident as a hate crime and bring the perpetrators to justice to show that hate and violence are not tolerated in our society," he added.